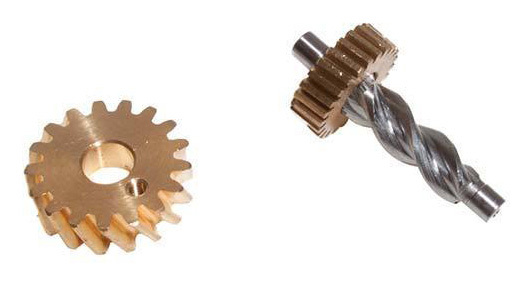 It looks as if the way forward is to replace the worm-driven gear wheel and its accompanying shaft. 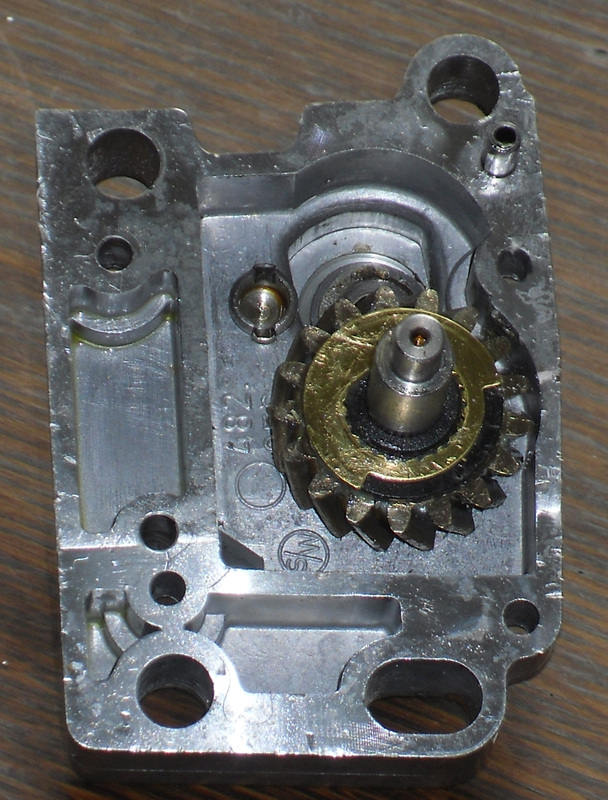 The above parts are available as a kit, together with the gear wheel that attaches to the shaft that comes into the motor body and is part of the external latching mechanism (see pic). The instructions for the above kit say that both parts must be used in order to effect the repair. Why should this be? If the existing gear wheel on the latching shaft is in good condition and the new shaft that's driven by the worm gear is identical to the one you're replacing, that's going to work, isn't it? My reason for asking is that I don't want the hassle of having to tap out or press out the latching shaft from its companion gear wheel. An additional complexity to that job is that there is some sort of switch mechanism lying directly on top of that gear wheel (see pics). The mechanism is (presumably) designed to act with the two copper arms with electrical contacts on the end and seems to comprise a black disc upon which is laid a brass disc with a narrow section cut out of its edge. The black/brass disc is splined to the shaft and will, I think, just lift away from the gear wheel to facilitate replacing that gear wheel. So, do I need to change that gear wheel? Gear wheel is slipping so thats the fault ..
Its a matched pair as far as im aware .. you might find if you try and fit a new gear to your old shaft it wont fit . Also its a little hard to say if the shaft has also worn enough to cause a premature failure if you just fit the gear . Thanks for the reply, Demort. I hope I haven't confused you with my description of what I'm thinking of doing. As shown in the pic, the kit comprises a gear and a gear/shaft combination. I'm not thinking of connecting the new gear to the existing shaft. My idea was to use the new gear/shaft combination (both parts joined solidly together as shown in the pic) but not to use the other gear to replace the existing gear that sits on the shaft attached to the external locking mechanism. That would mean that the slipping union of the existing shaft and gear driven by the worm drive would be completely replaced with the new shaft and gear. The new shaft, turned up by the new gear, would then turn the existing gear that drives the external locking mechanism. Hopefully, that makes it a little clearer. Hell im always confused these days .. not sure if its old age or spending too much time on here lol . The repair kit arrived this morning and the parts appeared absolutely identical to the existing parts in the motor gear. 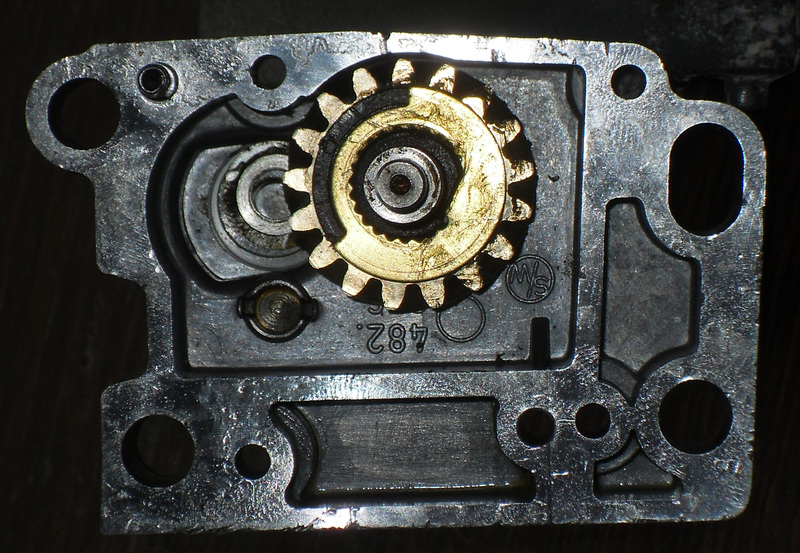 The existing gear wheel (attached to the external latching mechanism) was in very good condition so I decided not to replace it. The other existing gear wheel (driven by the worm drive) and its attached shaft were simply not gripping each other and were therefore useless. I replaced these with the brand-new parts from the repair kit. Upon reinstalling the motor into the hood, I pressed the button and the hood rose and descended upon the top of the windscreen – where the newly repaired motor completely failed to operate. I was about to take myself off to the local canal and throw myself in when I remembered that I hadn't reconnected the motor to the car's electrical system. I raised the hood again, reintroduced the relevant electrical connectors to each other and pressed the button again. The hood rose, descended upon the top of the windscreen and latched down perfectly on both sides. Many thanks to everyone who's contributed to this thread. Apart from all the information and advice, I'm also grateful for the sheer support offered. If you look at the rear seats and then let your eyes go to the carpeted inside wall of the car adjacent to either seat (just to the rear of the upper back of either front seat) you will see a round, black plastic cap about 2 inches in diameter set into each wall. 1. Remove both caps and you will find a nut under each one. 2. Using the wheel nut wrench from the toolkit, loosen both nuts about two turns. 3. Lift the hood forward and put it down on the windscreen frame. 4. Operate the rocker switch until the indicator light goes out and the hood is secured to the windscreen frame.